This page hosts the final report of the Graduate Standards Programme (GSP) produced by the Quality Enhancement Group of the Higher Education Quality Council (HEQC). The GSP was undertaken by a group of researchers led by Robin Middlehurst and Peter Wright between 1995-97. The work informed the National Committee of Inquiry into Higher Education Chaired by Sir Ron (later Lord) Dearing and some of the Committee's recommendations relating to assurance of standards can be linked to the GSP work. 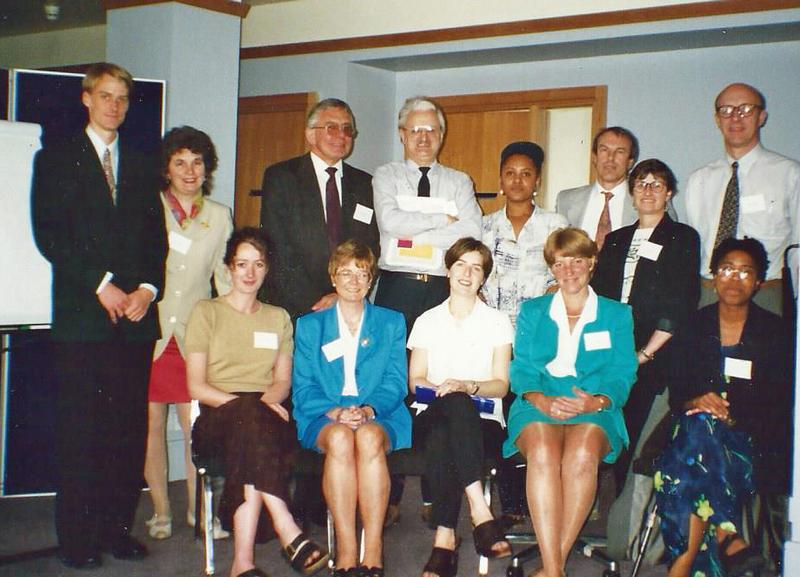 There is virtually no mention of this work on the internet, or HEQC for that matter, its as if it never existed and so it it right to try to address this matter here, in part to honour the memory of Peter Wright (third from left) who recently passed away. After the massive expansion of higher education between 1988-93 concerns for academic standards began to emerge. In 1994 the Secretary of State for Education 'invited' the sector to give greater attention to 'broad comparability of standards' across UK HE. The representative bodies of higher education institutions (Committee of Vice Chancellors and Principals -CVCP, and Standing Conference of Principals of Colleges of Higher Education -SCOP) invited their agency the Higher Education Quality Council to undertake a review of the way academic standards were defined, assessed and quality assured, and to consider the feasibility of defining threshold standards that could be applied across all degree programmes. HEQC implemented a major R&D exercise between 1995-97 looking at many facets of the ways in which academic standards were determined and assured. This work, known as the Graduate Standards Programme, engaged the sector in serious discussions about the learning outcomes from an undergraduate degree and this intervention encouraged institutions and disciplines to consider the nature of the knowledge, skills, competencies and qualities gained through a particular academic programme leading to the award of a degree. The terms 'graduateness' and 'graduate attributes' were used to describe the outcomes of a degree. Between 1996-97 a dozen reports were produced covering such topics as - threshold standards, process of creating academic standards, role of professional bodies in the making of standards, comparisons of degree results from different institutions, regulatory frameworks for assuring academic standards, understanding standards in modular curriculum frameworks, assessment and the role of graduateness, managing flexible curricula, surveys of awards in different institutions. The GSP research laid the foundations for new approaches to defining standards developed by the Quality Assurance Agency (QAA) - for example concepts of graduateness underlie the practice of subject benchmarking which were developed for all subjects from 2000 and also the idea of graduate attributes profiles developed and used by many higher education institutions. Two other strands of the GSP were important in the context of encouraging, supporting and recognising students' development and achievements through their lifewide experiences, the first was a study of the ways in which learning and achievements were being recorded across the sector, the second was developing the concept of a transcript so that it included much more information about students' achievements. This work laid the foundation for the Progress File later developed by QAA. In 1996 the Government set up a National Committee of Inquiry into Higher Education Chaired by Sir Ron (later Lord) Dearing. The work of the Graduate Standards Programme on making the standards and outcomes of learning more visible informed the work of the committee and some of the Committee's 120 recommendations were influenced by the GSP reports. The Committee also recommended the formation of a new agency for quality and standards (Quality Assurance Agency) and many HEQC staff were transferred to the agency. In this way the thinking of the quality enhancement group continued into the QAA and tyhe research project that had been the GSP became the policy development project of QAA under the leadership of Peter Wright. Between 1997-2000 the QAA Quality Enhancement Group developed, with the sector, a new Quality Framework and Code, and policies on Programme Specifications, Subject Benchmarking, Progress Files -including Personal Development Programming all of which had their roots in the GSP.